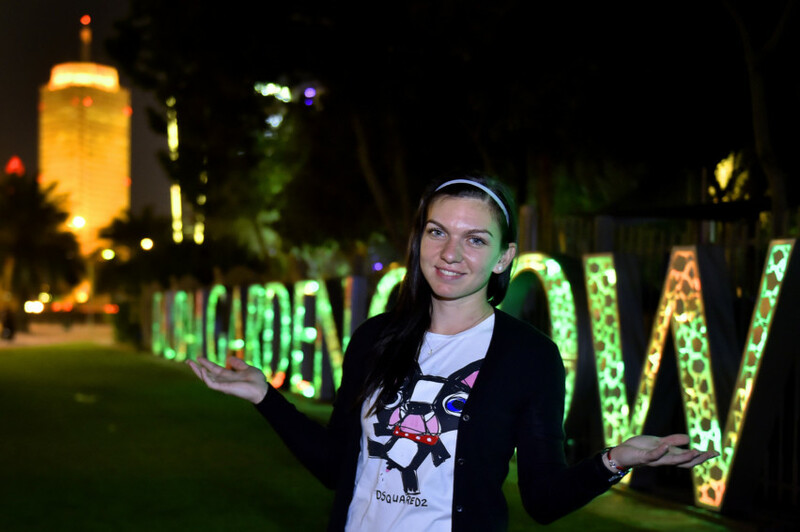 Romanian tennis player Simona Halep is being bathed in the light of the Dubai Garden Glow. She wanders past giant ants, dinosaurs and tulips, but it’s the lions that have her hooked. “We don’t have things like this back home,” she says. It’s about time Halep treated herself to a bit of sparkle. It has been a tough year for the top seed, who has experienced problems with her nose during recent tournaments. But she’s back in a big way, postponing her surgery to defend her title in the Dubai Duty Free Tennis Championships this week. It was odd to see the world number three off-court. Usually dressed in fluro Adidas and full of energy, Halep was remarkably relaxed in jeans and a t-shirt, her hair loose at her shoulders. She was ready for a giggle as she stood in front of the twelve-metre-high Burj Khalifa made from recycled medicine bottles. She walks past a giant flamingo and stops briefly to let the camera crew from Dubai Duty Free grab a few takes. Halep continues talking but can’t be heard over the call to prayer. Dubai Tennis Championships Women’s Singles titles: 2015 (beating Karolina Pliskova). — Charlotte Moore is an intern with Gulf News.